Sophia Seaboy performs the Fancy Shawl Dance as part of the Red Boy Production Company presentation at Fort Irwin’s Native American Heritage Month celebration Nov. 8. FORT IRWIN, Calif. — The sounds of the sacred drum and traditional Native American songs filled the Sandy Basin Community Center Nov. 8 for the annual Native American Heritage Month celebration hosted by the Fort Irwin Medical Department Activity and Equal Opportunity Office. 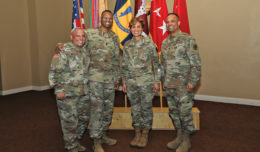 The event highlighted the many contributions made by Native Americans to the U.S. Army and other military branches. Per capita, Native Americans serve in the military at the highest rate of any ethnicity. Lupe Lopez, founder and owner of the Red Boy Production Company, gave the event’s keynote address before introducing the company’s singers and dancers. They dazzled the crowd with performances of traditional dances, including the Fancy Shawl dance, the Jingle Dress Dance, the Northern Traditional Dance, the Hoop Dance and the Fancy Dance. It is the company’s goal to dispel stereotypes about Native Americans by sharing their culture through song and dance, said Lopez. 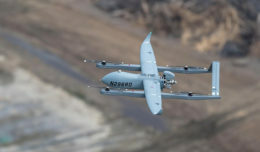 Lopez has spoken and performed at Fort Irwin several times in the past. 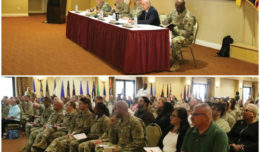 Outreach is key to fostering understanding and making sure that Native American communities are not left out of key decision-making processes, she said, adding that Fort Irwin should be seen as a model for other government organizations and agencies. To show their appreciation and generosity, Lopez and the Red Boy Production Company gave special Pendleton blankets to NTC and Fort Irwin Equal Opportunity Advisor Sgt. 1st Class Zachary Conklin, and two Native American Soldiers stationed at Fort Irwin: Staff Sgt. Andrea Hamilton, Dental Command; and Spc. Tyler Hardman, 2/11 ACR. 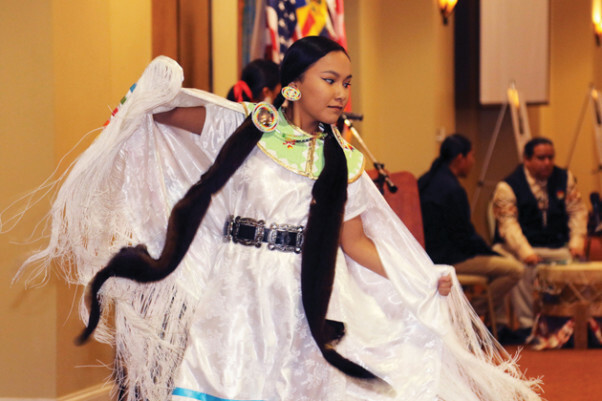 While events like the Native American Heritage Month celebration are important, Lopez said it is crucial to support Native Americans at all times. The best way to do so, she said, is to speak up and make sure Native American voices have a seat at the table.